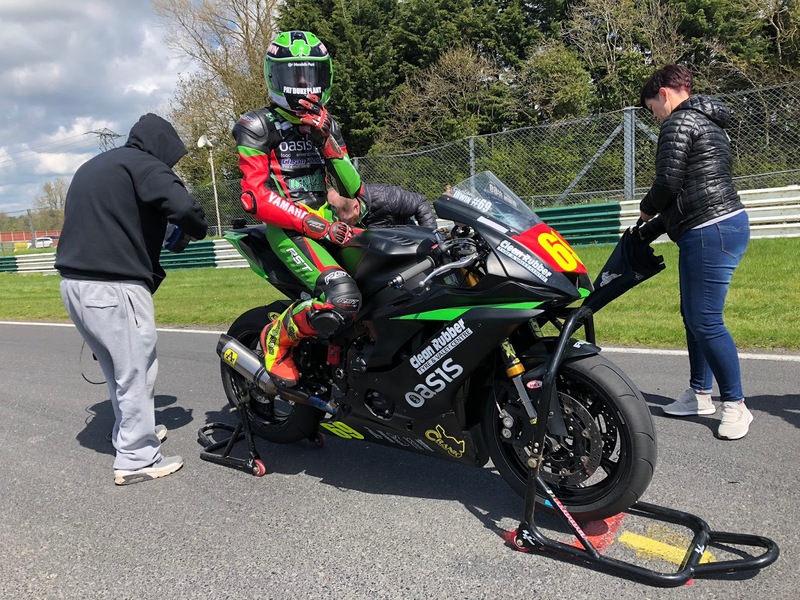 Donegal's Caolán Irwin has been announced as the Masters Superbike Championship Young Racer of the Year nominee for April following his trio of second places at rounds four, five and six of the Masters Supersport championship at Mondello Park. The Masters Young Racer of the Year award is open to any rider who is under twenty three and competing at the Masters. At each event one rider is nominated to go forward to the end of year shoot out where they will have a chance to battle for the €10,000 prize which is provided by Martin Birrane, owner of Mondello Park, Dawn International and Peter McMahon of EICL. Making his debut as a Pro rider at the Masters, twenty year old Caolán rode the Superstock machine he races in the British Championship and was having his first Supersport experience of the Mondello Park National Track and his first run out on the Dunlop tyres used in the Masters Championship. Despite having to adjust his machine to the unfamiliar tyres and overcome a power disadvantage, the Kilmacrennan rider impressed the judges from the outset by qualifying on the front row for race one. In the first of his three races Irwin lead away from the lights, but his lead only lasted to turn three where his inexperience with the Dunlop tyres caught him out. As he arrived at the corner there was a localised shower and he backed off too much due to being unsure of how much grip he would have, dropping to fourth place. A strong recovery saw him back in second by half distance and he held that position to the flag, taking fastest race lap to put him on pole position for race two. Over the remaining two races the Donegal racer chased Championship leader Dean McMaster hard but despite almost matching his lap times he was unable to get the better of his more experienced rival and had to settle for two more second places. Speaking on hearing of his nomination Caolán said, “I'm really delighted to get the nomination and now for the third year in a row there will be an Irwin in the final, with my brother Rhys having been nominated the previous two years. With three podiums and now the Young Racer nomination I never imagined my first weekend on the Mondello Park National Track in the Supersport class would go this well. I'm off to Donington to race in the British Superstock 600 Championship at the World Superbike Championship event this weekend so I will miss the next round of the Masters, but I will be back later in the year looking for my first win. Once my season is over I'll be concentrating on preparing for the final and I will go into it knowing what to expect having seen what Rhys had to do over the past two years. I'd like to thank everyone who has supported me in getting to where I am and especially Mondello Park for putting this award together and for running such an excellent event at the last Masters." Caolán Irwin now joins March nominee Aaron Wright in going forward to the October final and as part of his prize he will also receive a free entry, testing and garage space for the next Masters event he competes at. For more information see www.masterssuperbike.ie/young-racer-of-the-year.